Disney Releases Cast for Live Action Into the Woods! I’m a total theater geek. Heck, I MAJORED in Theater Studies in college. So, I am just incredibly excited about Disney’s production of Into the Woods! My husband played one of the princes in his high school’s production so you KNOW there is going to be LOTS of fun singing going on in this house leading up to the release. For the record, my voice is no where near as good as my husband’s but that just means I will sing LOUDER! My kids are too young to care that mommy can’t carry a tune. IN honor of this announcement, I broke out my mad photoshoppin’ skillz…which, to give you an idea of my vocal talent, are probably superior to my singing abilities. Anna Kendrick is going to rock this! What do you think–does Chris Pine have the chops? Will this be one of Johnny Depp’s brilliant roles or one of his embarrassing disasters? Meryl Streep is frickin’ Meryl Streep. Does the rest of the cast have what it takes? Take it away, press release! As one of the lucky bloggers invited by Disney to experience the Disney Dream Christening Cruise for media, I seized the opportunity to take a family vacation. We added on days at Walt Disney World (and Sea World…shhh…don’t tell Mickey!) before and after the Disney Dream Christening and cruise and found a treasure trove of military discounts and benefits available for our servicemembers and their families as well as a lot of support for our troops and appreciation for the families that stand by them. Before Disney moved us into our pre-cruise room at the Polynesian, and on our return from the Disney Dream ship, we stayed at the gorgeous Shades of Green Armed Forces Recreation Center. Regular room rates at Shades of Green start at $95, with accommodations comparable to a Deluxe Disney Hotel, like the Polynesian, which starts at $395. If you move to Moderate Disney Hotels, those start at around $155. Even Budget Disney accommodations start around $90. And, Shades of Green also regular offers special deals, including seasonal discounts and special discount packages for soldiers on R&R and veterans returning from tours of duty at OIF and OEF. So, you might end up with Deluxe accommodations for the same price as a Budget hotel, or even less! Mickey Mouse greeted us in the Shades of Green lobby. At Shades of Green, you will find lovely grounds, featuring koi ponds where your children can feed the fish and watch ibis and cranes or race remote-control boats. There are two sit-down restaurants, a cafe, an ice cream shop, a coffee stand, a snack spot, two heated outdoor pools, a gym, a golf course, a spa, laundry facilities, a P/X (AAFES) store, a gift shop, guest services for planning excursions, a ticket booth for Disney parks. Check out this Mickey Mouse Waffle off the menu at Shades of Green–just $3.95! Although not part of the Disney Resort system, Shades of Green is located within Walt Disney World (right next to the Polynesian) and there is regular shuttle service to the Disney transportation hub and monorail from the hotel’s cafe. The military savings did not stop there! A regular four-day pass for an adult, with Park Hopper Option, is $286. You will still also save on children 3-9 and children under 3 are free. 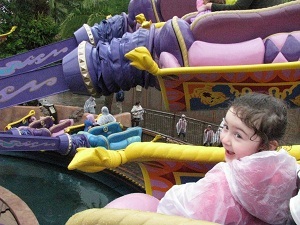 Toured The Magic Kingdom in the rain–NO LINES! Rode a magic carpet and a flying elephant! Balanced with the flamingos at Animal Kingdom! Gave Mickey Mouse a hug and kiss! Roped a few bad guys with Woody and Jesse. Were wowed by the Electric Light Parade. 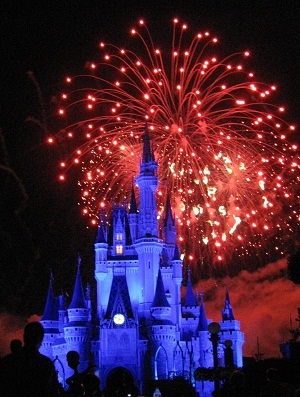 Saw the fireworks at the Castle! Climbed aboard a giant ant. 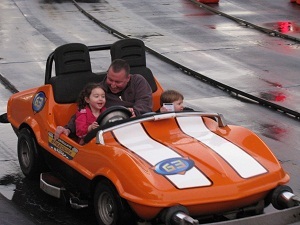 …then watched stunt cars jump, crash, and explode! Became apprenticed to a powerful sorcerer! 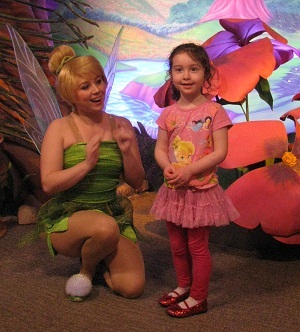 And saw so many live shows with our favorite Disney characters and stories!!! And even got a kiss from Snow White! 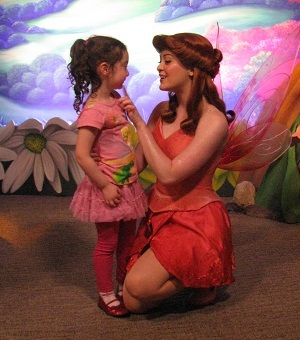 Pixie light guided us back to our beds, where we dreamed of adventures for another day! Disclaimer: My flight to Orlando, our family’s room at the Polynesian, and my cruise fare, as well as a bunch of other swag so generous it made my head spin, was on the tab of the handsomest mouse in the world and his friends at Disney Cruise Line. Most of the services, amenities, and other entertainment mentioned in this post were paid for by me and the handsomest soldier in the world, my husband. All opinions are my own. Set Sail on a (Disney) Dream! Before my husband and I had children, we traveled a lot. Not through the military, though–we only ever got posted at Fort Hood! True, Texas is like a whole other country, and we had a great time visiting San Antonio and Austin, but I was hoping for Germany, Italy, Japan, or even Korea. Now that we have two young children (with a third on the way) and my husband has a civilian job as well his National Guard commitments, it is getting harder and harder to find the money and the time to make vacations happen. I was lucky enough to win a trip to Portugal on Twitter, courtesy of Voyage.TV, and we took a family road trip last summer down to Savannah. Back in October, I mentioned that I would love to go on a cruise with my family. Disney Cruise Lines invited me through my “parenting lifestyle blog”, Mamanista, to be their guest on the inaugural Christening Cruise of the Disney Dream! This will be our first cruise with the kids, and our first time at Disney with the kids, and we are all extremely excited. 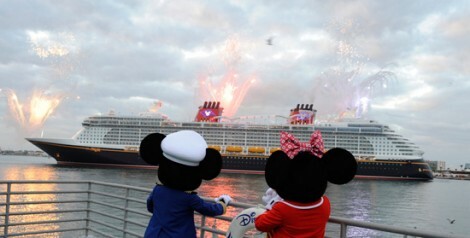 The Disney Dream is the majestic third ship in the Disney Cruise Line fleet. Boasting 14 towering decks, a ship length of 1,115 feet and a maximum width of 125 feet, the 130,000-ton vessel includes 1,250 staterooms and has the capacity to comfortably accommodate 4,000 passengers—along with the over 1,458 Crew Members who tend to the needs of every cruise Guest each and every day. Building on the classic style of the previous 2 ships, the Disney Magic and the Disney Wonder, the Disney Dream is a valiant vessel distinguished for its classic early 20th-century design—which harkens back to the golden age of cruising—and state-of-the-art technology. As can be expected from Disney, the cruise liner was specially designed with families in mind, combining sleek style and convenient facilities with splashes of magic and cruise-industry firsts—like the splashtacular AquaDuck, the very first water coaster at sea. My husband and I never had a “baby moon” since he was deployed to Iraq for all but the essential part of the pregnancy (I found out I was pregnant two days after he left). Having two kids, now, I know that it isn’t just the first baby that changes the family dynamic. So, it will be really wonderful to take a special trip with our two little ones before the new baby arrives. And my husband and I may even get some time to ourselves since there is a nursery and youth clubs. We will also be spending some time at the parks before and after the cruise. Disney is putting us up the day before the cruise but before and after we will be staying at Shades of Green, an Armed Forces Recreation Center. We are looking forward to checking out this special perk for servicemembers and their families! I’ve already downloaded some map and wait-time applications for my phone and welcome any suggestions or tips for Disney Cruises or tips for what to do at the park!